At Pearce Autotech we specialize and only work on MINI, BMW, VW, and AUDI. Our staff is highly trained and have over 60 years combined experience on these makes! Pearce Autotech uses the latest technology and software to pinpoint and repair problems quickly. We are factory trained and offer full service and general maintenance repairs for your MINI, BMW, Volkswagen and Audi. Owner Jason Pearce is a certified ASE Master Tech and has been a European Auto Repair Technician since 1986. Jason has extensive experience servicing European autos. He has worked with both independent garages and dealers specializing in Saab, Volvo, Volkswagen and Audi. While in the dealership environment Jason was factory trained and became an ASE master tech. In 1994 he opened Pearce European Auto Repair in Santa Cruz, an independent repair shop. Pearce Autotech in San Francisco was opened in 2008. At Pearce Autotech we are devoted to customer service. We know you depend on your car to get you, your friends and family safely to your destination. Therefore we give attention to every car as if it were our own. We take the time to thoroughly explain diagnostic results and recommend the appropriate repair to you. We are dedicated to giving you outstanding service, convenience, as well as honest auto repair. 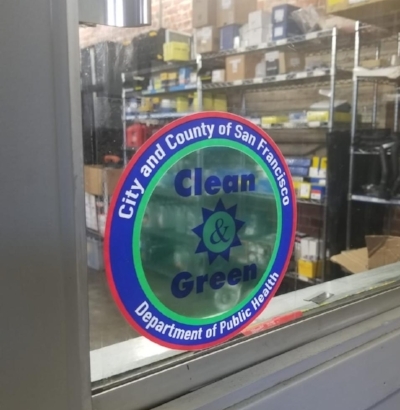 We are proud to be awarded our “Clean & Green” Certification from S.F. Department of Public Health. Visit https://www.sfdph.org/dph/eh/green/greenPrgrm.asp for more information. We recycle all materials from parts packaging to scrap metal. We use a non-toxic Aqueous tank to clean parts instead of harsh chemical solvents. We also have equipment that captures and recycles your vehicle air conditioning refrigerant. We are continuously looking for new alternatives to the old ways of auto repair to help prevent pollution and minimize waste. In an effort to save water, we are limiting car washing. If you want your car washed (or not) please let us know when dropping off your car. Being a small repair shop allows us to focus on customer service and we do repairs by appointment only. We always do our best to accommodate emergency repairs. You can call 415-546-5123, 415-546-5153 or email pearceautotech@gmail.com to make an appointment. When making an appointment please let us know all repair concerns you have so we will allow enough time to address them properly. For same day service we need you to arrive early, best is by 8 am. If this is not possible please let us know when making your appointment. Not all repairs can be done in one day so please let us know if you will need a rental car. When arriving at Pearce Autotech you can drive into the front door of the shop or park parallel in front of our driveway, please do not block the sidewalk. Metered street parking is often available and free only until 9 am (please be aware of this). “Come say Hi to Blu! Close to Muni and BART!